You are all familiar with the hit Netflix show Stranger Things, right? That wonderful show has really cheered me up and given me hope for humanity, despite the Demogorgon and the Shadow Monster. 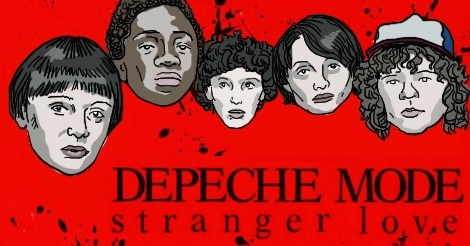 Lately in my car I have been rocking out to Depeche Mode, which makes me think of the ‘80s, which of course is when Stranger Things take place. I got to thinking, “what if each ST character had a DPM theme song?” I think it could happen. I chose this song to represent his relationship with Eleven. He clearly depends on her a lot, whether or not she’s around. He is heartbroken whenever she can’t do what he wants, hence the title. This kid has placed a lot of expectations on another kid. Maybe he needs to focus on his own ingenuity. Dustin is obviously the comic relief. He’s smart and fun-loving. What other song would be more appropriate to accompany someone who is so positive and upbeat? This is probably his favorite DPM song anyway, so it suits him the best. Jonathan is an honest, bare-bones kind of guy. He hates fakeness. This song is about getting down to the bare essentials of life, and it reflects the conversation he and Nancy have when they are in the woods looking for Barb. Honesty and transparency are of great import to him. Steve wants you to know that he has been around and seen it all, and he wants to share it with you, or rather Nancy. Let Steve give you a glimpse into the way he sees things for a change. Isn’t it Hopper who said, “Mornings are for coffee and contemplation”? He is a simple man who wants nothing more than to be left alone. When he loves, it’s with a silent, protective ferocity. Don’t disturb his peace, or you’re gonna get cut to pieces! Well, at least with his brooding stare and a punch. So, maybe there won’t be so much cutting. Papa is a man on a mission to get results. He doesn’t care who he hurts in the pursuit of power and knowledge, including children. Who is the real villain in the story, the Demogorgon or Papa? Nancy feels responsible for what happened to Barb. Her urgency in finding her best friend is complicated by the fact that Barb was abducted by an otherworldly monster rather than a common kidnapper. The quest for Barb is what brings Nancy and Jonathan together, and may quite possibly be what seals the deal for J’s feelings towards Nancy. Nothing says teenage love story like a shared tragedy. Lucas is the resident skeptic. It took a while until he believed that Eleven was telekinetic, and even longer until he accepted her as an ally. He is scientifically minded and needs to see at least convincing evidence, if not proof before he buys what you are selling. This song addresses the unfairness of life based on the experiences of the characters. The song provides evidence, which is what Lucas is looking for. Billy does what he wants when his abusive father isn’t around. He’s an unapologetic sociopath, and he expects you to just deal with it. However, he sure can turn on the charm when the ladies are present. Just look at how he wrapped his tentacles around Mrs. Wheeler! Strange highs and strange lows indeed. Eleven is your savior. She always comes in and saves the day. Yeah, she’s just a kid, but she is hella powerful and knows she can defeat the Demogorgon. Watch her rise to the occasion. I mean, she was even sort of resurrected. Pick up the receiver Mike, because this girl sure made you a believer. Joyce is a great mom, but she’s been going it alone for too long. She’s a take charge woman, but sometimes it’s nice to catch a break. In comes Bob, her lover and a father figure for Jonathan and Will. Joyce is definitely the dominant personality in the relationship, but Bob has the willingness to step up and take the wheel from time to time. Living with a guy like Billy is a nightmare for Max. She is a tough kid, but she needs a break from all the negativity. In come Lucas and the boys, willing to let her into the club and finally have an escape from her crazy step-brother. Of course, the whole Shadow Monster kinda ruins the peaceful aspect of having friends. Poor Will. First he gets taken by the Demogorgon, which is pretty terrifying, but doubly so for a twelve year old. Then he has to adjust to civilian life and wicked PTSD to boot. THEN he gets possessed by the friggin’ Shadow Monster! Ugh. Someone give this kid a break. If anybody else went through these traumas, maybe Will could find some comfort in knowing he is not alone. Maybe Barb — never mind. We all know how that turned out. Bob is over the moon for Joyce. It’s safe to say that he holds her near to his heart, and his duty to love is pretty obvious. As a flaming romantic, his theme song tells the story of the importance of love itself, and sharing the good news with others. So there you have it. Our beloved cast of misfits complete with a great soundtrack and their very own appropriate theme songs. If you have any songs that you think would be more fitting, whether by Depeche Mode or someone else, feel free to leave a comment! I’d love to hear from you. Remember: don’t be a mouth-breather and don’t get eaten by the Demogorgon!